A new memorial to pioneering aviatrix Amy Johnson has its unveiling ceremony on 17 September 2016 at Herne Bay. The statue, on Herne Bay promenade, is near to the site where Amy’s Airspeed Oxford ditched into the sea in January 1941. To mark the memorial occasion a portrait of Amy Johnson, painted in 1932, has resurfaced in the Solent area. A 1932 painting of Amy Johnson by Concord Morton. 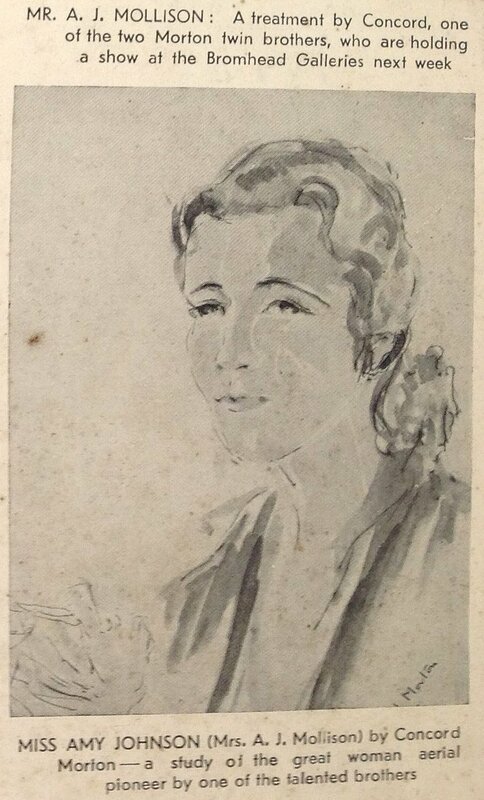 Exhibited at Bromhead Gallery, Cork Street, London in the 1930s. Shown on Solent Aviatrix by permission of the private owner. 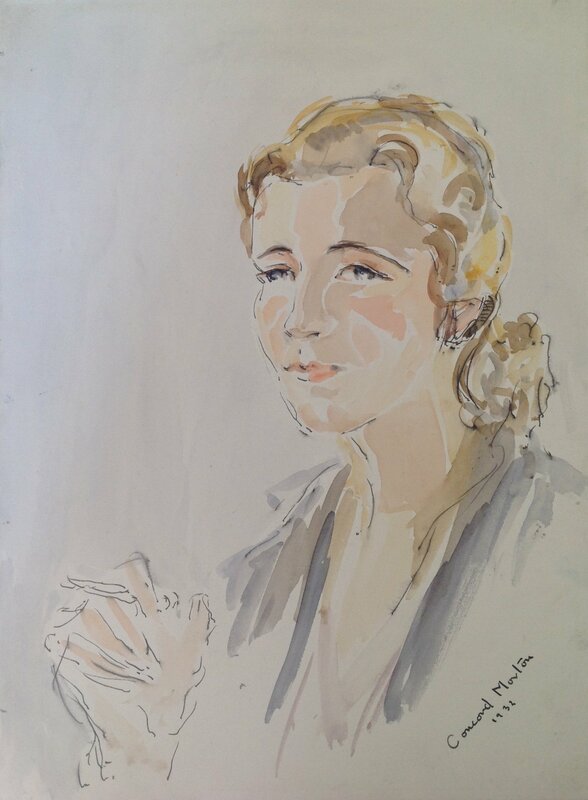 This delightful colour sketch was shown in a public exhibition at Bromhead Gallery, Cork Street, London, sometime during the 1930s. Harold Watts Bromhead owned and ran the gallery. The exact exhibition date isn’t known but this advert indicates it must have been during the few years that Amy was married to another pioneering aviator, Jim Mollison. Whilst married she was willing to be known as Mrs. A. J. Mollison. After Amy divorced Jim she reverted to using her maiden name of Johnson. The advert also states that a painting of Jim Mollison, by the same artist Concord Morton, was part of the exhibition. Both pictures are currently held in a private collection. Concord Morton was one half of a British art phenomenon – the Morton twins. Brother Cavendish was a celebrated artist. Concord is less well known because he died much younger. Both twins had work exhibited at the Royal Academy. In 1930 they worked on a series of paintings in and around Portsmouth Dockyard, including HMS Victory and Sir Thomas Lipton’s Shamrock yacht, which competed for the America Cup. Concord worked for a while at Camper and Nicholson’s boatyard in Gosport. 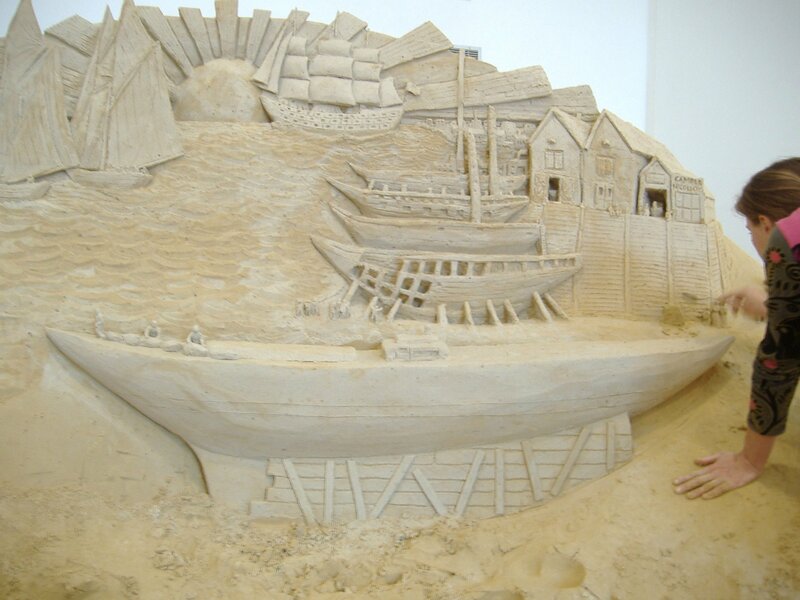 Camper and Nicholson boatyard with J-Class Yacht Shamrock as depicted in Sand Art at Gosport Museum. Photo copyright Anne Grant. The brothers also painted a full-length portrait of King George and Queen Elizabeth in 1937, in Coronation robes. It was huge at twelve feet by nine feet (4m x 3m). The twins attended every air show they could get to, including Hendon. They sketched the aircraft of the day. Thus they produced an artist’s record of some of the iconic planes and pilots of the 1930s. These include famous names that have gone down in history as the aviation pioneers. One such sketch is this study of wonderful Amy. Black and white, and sepia photos of her are plentiful. How many colour pictures are there of her? The subtle colours and quick, loose style capture the skin, eye and hair tones that black and white photography can never convey. Concord Morton’s sketch of Amy is a very good likeness. Compare it to this photo of her taken in 1934. The photo was taken in Park Lane Hotel, London. 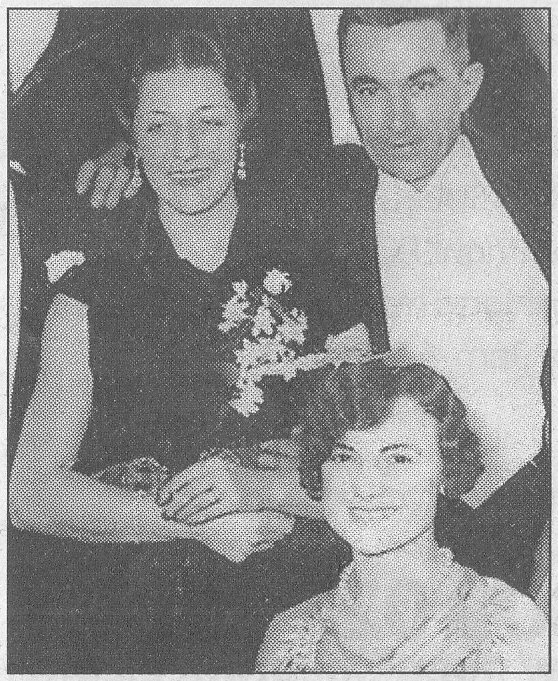 Gladys Hermiston Hooper played piano in the hotel quintet. She was a friend of Amy. Gladys is seated at Amy’s feet. The photo is shown here by kind permission of Derek Hermiston Hooper. Amy Johnson and Gladys Hermiston Hooper at Park Lane Hotel, London 1934. Photo courtesy of Derek Hermiston Hooper. At the start of the Second War World the Morton twins worked for Saunders Roe, Cowes, Isle of Wight. Their draughtsmanship skills were put to good use, doing their bit for the war effort. Perhaps now, with the re-emergence of some of Concord Morton’s work, he will receive the same contemporary level of recognition as his more famous brother. My thanks to the owner of the Amy Johnson painting, for permission to publish it on Solent Aviatrix website. A special day indeed. One person who’s had a preview of the paintings of Amy and Jim is Jane Priston, project manager for the Amy Johnson Herne Bay project. Jane is the driving force behind getting the bronze statue cast and erected. It has been a race against time for her. Isle of Wight resident Derek Hermiston Hooper, as a 4-year old, went for a joy-ride flight with Amy Johnson in her record-breaking bi-plane ‘Jason’. His mother Gladys frequently flew with Amy. Derek says, “On the eve of one of Amy’s long distance flights, she stayed with my parents.” He also knew Jim Mollison. Derek hopes one day to be able to visit Herne Bay to stand beside the statue of Amy Johnson. Until earlier this year when she passed away, Gladys held the record of being the oldest person in Britain. She died age 113. Derek, who has also heard about the Concord Morton sketch of Amy Johnson, is looking forward to seeing it for the first time. Well, here it is Derek. The wait is over. The painting of Jim Mollison will be published here soon. Anyone wanting to know more about the paintings should use the ContactContact page to send your questions. Prince Michael of Kent has been invited to perform the unveiling of the Amy Johnson statue. Amy’s godson is expected to attend. To learn more follow this link to Amy Johnson Herne Bay Project.